Packaging firm DS Smith has designed new packaging solution for Spain-based brewery La Virgen. A 6-pack holder has been designed by DS Smith with a logo featuring a woman wearing a red carnation in her black hair. The new format, which includes a six pack of bottles, is intended to maintain the design and aesthetic standards of the brand. The solution aims to achieve the authentic character of the product while guaranteeing the visibility and spirit of the brand. In order to maintain and improve the visibility of the brand, the firm opted for a reproduction of the original logo of the brand with a single dark color. This allows the stands out on the natural color of the cardboard, the company said. The firm also designed a grouper with a simple and cost-effective die cut plate in order to allow stacking of the packs and protect them during transportation. In addition to reducing costs, the new solution allows the bottles to be perfectly fastened inside it. In February 2017, DS Smith designed new packaging for Käsityöläispanimo Pyynikki brewery’s Post Mortem Imperial Stout beer. A macabre miniature coffin package has been designed with appropriate size for the beer bottle. The firm produces a range of solutions, including transit packaging, consumer packaging, displays and promotional packaging, customized protective packaging and industrial packaging. 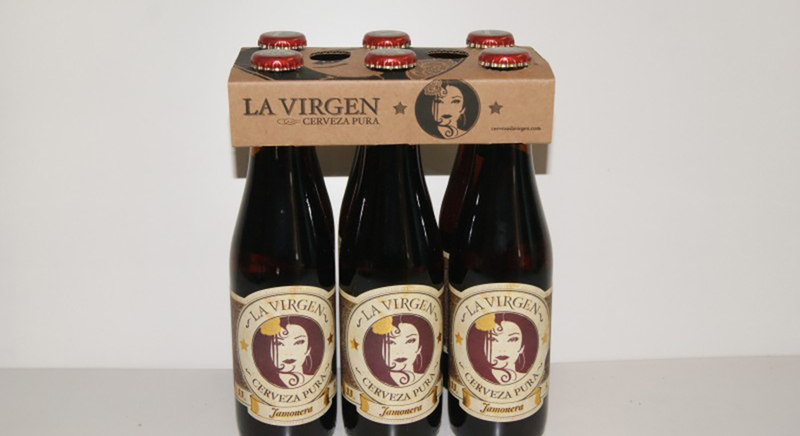 Image: DS Smith has produced a new packaging solution for La Virgen for its beer brand. Photo: courtesy of DS Smith.